"Selfie Check In...Selfie Check Out"
Bundy Clock...Time Cards...Biometrics... all these are things of the past. What is in right now is mySelfieTime. 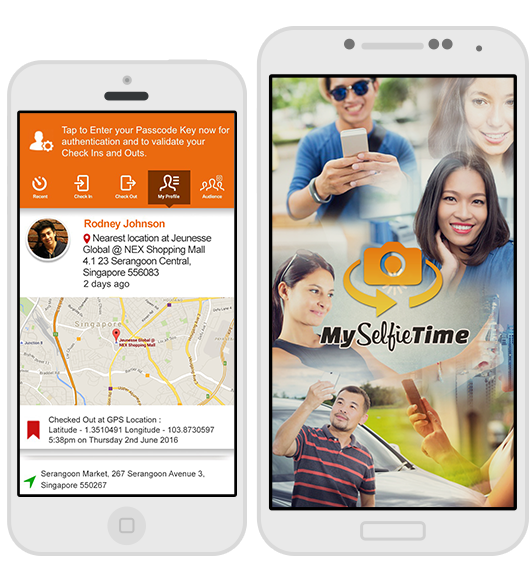 mySelfieTime is by far, the most accurate, most reliable, fun and in style time management/monitoring system. The website is backed up with a mobile App wherein registered mobile users need to have it downloaded on their iPhone or Android Phones via App Store or Google Play. The mySelfieTime app is where they Selfie Check In and Out. The website, on the other hand, lets you manage and monitor all check ins and outs. mySelfieTime is ideal for use for small and large scale businesses like messengerial jobs, sales, retail, logistics, delivery services, project-based businesses and the like. More so, it is proven useful and efficient for household as you monitor members of your family, drivers and other household members. A keen and detailed perspective of your registered app users' location as a group, viewing all of them is made possible through various maps and satellite images. Get to know on details where a specific registered app user have been selfie checking in and out, also on a map. Personalize and customize your exclusive page where you get to see all your registered app users' selfie check ins and outs; on your selfie feed. Any and all actions made will instantly give you notifications be it done by you or anybody else. Generate, download and save reports in a few clicks. No need to wait to have it emailed to you. Instantly generate them in pdf or excel formats. All of your mobile phone's waypoints and data are automatically saved for your retrieval and reference – all 365 days of the year. No need to buy a biometrics device, thus making the service way too cheap! Maximize all these features and benefits whenever you want to wherever you are.